A series that starts out incredibly strong is both a blessing and a curse. A blessing for obvious reasons, but also a curse, because there's nowhere to go but down. A rare few series are lucky/skilled enough to maintain the same level of excellence, but I've found that most disappoint. 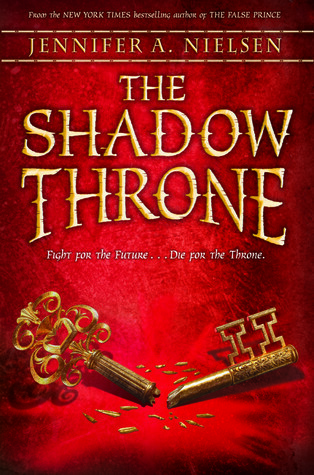 The Shadow Throne, the final book in The Ascendance Trilogy is a very good book, but does not reach the impossible high bar set by The False Prince, the first book in the series. Two things made The False Prince stand out to me: 1) Jaron's sarcasm and cunning and 2) The shocking twists and turns (which in retrospect were very predictable but took me completely by surprise). Jaron is still the smart, funny young man who frequently risks his life that we met in the first book, but he's more subdued. This is understandable since, as king, Jaron has huge responsibility on his shoulders and he is leading a war where his countrymen are dying. Still, it takes some of the fun away. I also thought this book was too predictable. There were some huge twists, but I thought the clues for how things were going to eventually turn out were too obvious. Much more obvious than the clues in The False Prince. Perhaps if I was a young YA or older MG reader, the age group for which this book is written, I wouldn't have caught on so quickly. I shouldn't complain so much about this book, because it really is enjoyable. Jaron has a big hero complex and insists on running into danger headfirst. This sometimes gets him into trouble, but he's always quick with a witty insult for his enemies. In the middle of a war, there are an ample supply of dangerous situations for Jaron to encounter, so the book doesn't lag. I love seeing how Jaron always has some way to get himself out of trouble. The first book in this series was partially about Jaron learning that there are people he can trust and the second book was about solidifying that trust. Now, Jaron has people that he trusts completely and that has changed the way he views the world. He's much more of a leader than a manipulator. Romance plays a small role in this series and a slightly larger one in this book than in the others. It's a pretty simple plot arc, in a good way. It adds somewhat to the story, but mostly never takes anything away from it. Plus, I love that the two leading ladies, Amarinda and Imogen, are strong girls who the boys want to "protect" but in reality can take care of themselves perfectly well. The Ascendance Trilogy is one of the best fantasy series I've read. Certainly the best that's aimed at the younger end of YA. The Shadow Throne does not quite live up to the perfection of The False Prince, but it is still superior to most books out there. I highly recommend this series. Aww, this makes me a bit sad that this series wasn't as consistently strong as one would hope. I'm still definitely going to read The False Prince sometime though! Hopefully soon. You make it sound sooo good! Hmm, I like the way you out that. Sometimes the first book in the series is so good you expect better and more. That can be a curse. Will have to check this series out. I hate it when a book is too predictable. I am okay with it in a romance, but I don't like it most other books.